In this shoulder season, when the leaves are down and hiking trails no longer call, but before we have enough snow on the ground to play in or ice on the pond to skate on, my thoughts have turned to playgrounds. We explored the neighborhood park and playground while we visited Grandpa over Thanksgiving. It was typical shoulder-season weather in western New York, a gray, changeable mix of sleet, snow, rain, and wind, but not so harsh that Grandpa, Virgil, and I couldn’t walk a block to the park to watch the black squirrels race between oak trees and see how high we could go on the swings. After a short while, though, Virgil tired of swinging. He ignored the other equipment on the playground — a plastic horse on a metal spring, a seesaw sized for toddlers, a slide — and declared himself ready to go back inside. That got me thinking about a playground that opened in New York City this summer. Its unveiling received the kind of publicity normally reserved for theater openings: The New York Times and The New Yorker wrote lengthy articles; glossy design and architecture magazines covered it as well. This was no ordinary playground. 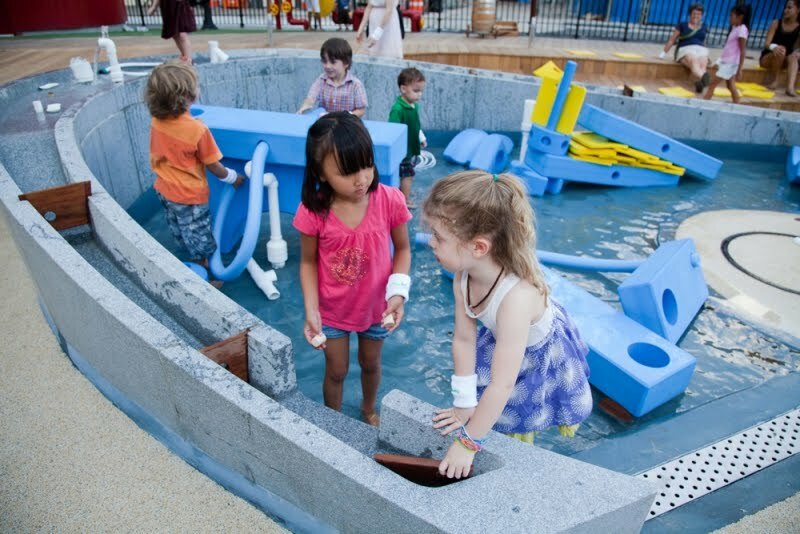 The Imagination Playground at Burling Slip, built over five years for $7 million on a former parking lot where fish were once unloaded for the Fulton Fish Market, is being heralded as an exemplar of the newest thinking about children’s play. Other groups were playing in this particular sandbox before David Rockwell and Imagination Playground. After 24-year-old Darell Hammond read a news article about two children who suffocated while playing in an abandoned car because they had no other place to play, he started the nonprofit that would become KaBoom!. The organization works collaboratively with communities to design their playgrounds, even including children in the design process, and keeps costs to a fraction of the Burling Slip’s by using volunteer labor. KaBoom's playgrounds mix traditional components with creative ideas generated by children and parents. Since 1995, KaBoom! 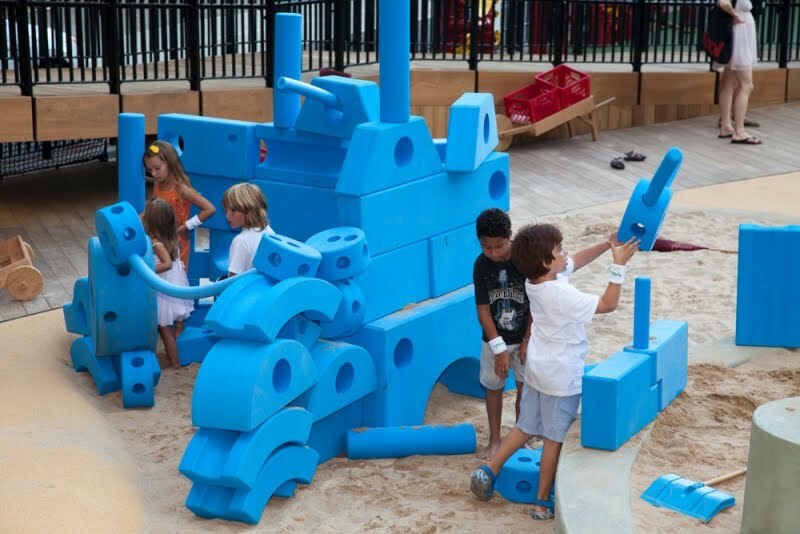 has helped build more than 1,900 playgrounds around the country. David Rockwell has teamed with KaBoom! to create Playground in a Box, which crams 75 blue-foam “loose parts” into a 5-foot by 5-foot container. 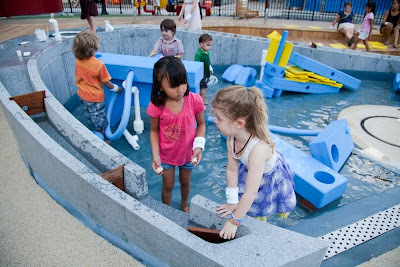 Other play spaces around the country are using Imagination Playground’s loose parts, including other spots in New York City, Pittsburgh and Allentown, Pennsylvania, a KIPP school in Washington, D.C., and Stepping Stone Museum in Norwalk, Connecticut. Boston Children’s Museum is slated to receive the bright-blue blocks. The new interest in creative, collaborative playgrounds appears to be driven by concerns that America’s overscheduled and sedentary children aren’t only losing out inside the classroom, compared to their peers in Europe, Asia, and Canada, but are also missing out on crucial development tasks outside of school. Research into play using brain imaging and animal observations leads people like Melvin Konner, an anthropologist at Emory University and the author of The Evolution of Childhood, to speculate that “natural selection designed play to shape brain development.” The research also suggests that the folks who built playgrounds out of bomb sites had the right idea: to fully work, play must involve some risk; its sharing and collaborations need to be negotiated with minimal adult intervention. When I think back to our walk to the park, I remember that the black squirrels kept Virgil interested far longer than the playground. Some outdoor educators are taking the concept of collaborative, “loose parts” play and moving it into the natural world. I’ll explore those ideas in my next post.